There is a checklist for almost everything. 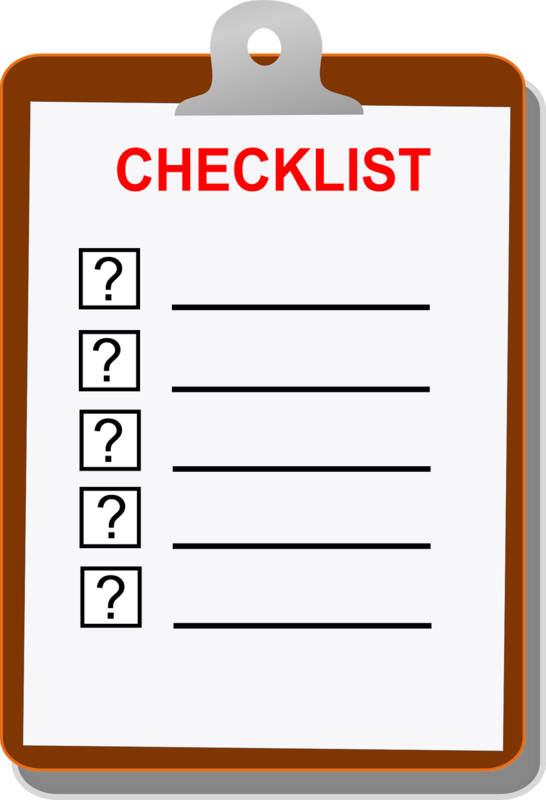 Checklists are prescriptive by nature and are easy to follow. If you are diligent, you would just plow through the list by priority. I love checklists! Honestly, who doesn’t? So I thought, why not create a prioritized personal finance checklist? And this post came about! As you go through the checklist, the important thing is to see where you have coverage and where you are exposed. I have done the prioritization to the best of my knowledge. If you do not agree with the exact prioritization, that is okay. The more important thing is to determine where you are exposed and determine what steps you plan to take to address them. If you don’t understand what a particular item in the checklist means, don’t worry. I will be covering each of these topics in a series of blog posts and will make the series as part of the education page for easy reference. As you can see, there is a lot more to personal finance than saving, investing, and retirement. You will hear a lot of talk about saving, investing, and retirement. However, you will not hear much talk about the other topics. Of course, talking about investing is more interesting than talking about disability insurance. I don’t like to think or talk about disability just like you. But I need to talk about it objectively from a personal finance perspective. It is something that needs to be taken care of and has a much higher priority and is close to the top of the list. Now that you have had a chance to see the items on the personal finance checklist, it is time to get your pencil and paper out. It is time for you to check off items for which you have coverage, circle items you need to understand or understand better, and finally mark the items that you need to act on. I will be honest with you. I will start out by telling you that I need to work on Estate Planning and Tax Planning. I am lacking in these areas. I have been deferring the estate planning. Shame on me! On the tax planning side, I had this eye balling approach which seemed to work for the past decade. I used to get a refund of about a few hundred dollars every year. However, for 2015, my eyeballing backfired on me. I just wrote a big check to Uncle Sam. So, for 2016, I have made it a goal to complete my estate planning and tax planning so that I wouldn’t be in for a surprise. What about you? Where are you exposed? What concerns you the most from the personal finance checklist? What would you like to learn more about? What action steps are you planning to take to address the identified gap(s)? I would love to hear your feedback. When it comes to Personal Finances, a list is necessary. Keeping the list updated is where I fail. I could add a monthly expense and forget to put it on the list. Actually, for business purposes, I do add many of those. But it does come under my personal finance because I’m a solopreneur. As I’m writing this, I’m thinking, I should have two lists one personal, one for business. I am so bad tracking what I spend. You just have given me a great idea. Thank you for your comment. It would be better for you to completely separate your personal and business accounting. The personal finance checklist is with regards to ensuring that you have all your ducks in a row (#1 to #11). I will be writing about each of these topics. Without a personal finance plan along with checklist, I would personally be lost and confused. I also do a priority list by using different color marker. Thank you for this reminder! Welcome to Stretch A Dime! Thank you for your comment. I have a personal financial plan as my uncle was very heavily into this when I was younger and he encouraged us all to plan ahead and know how and what we were doing with our money. I am so glad he did that. Thanks for the list, it is really useful! Kudos to your Uncle. You are one of the lucky ones to get early financial education. I had to learn things the hard way but I learned it soon enough thankfully. Thank you and you are very welcome! For both I have my details: scope, steps, and benefits. These are unique for me. Based on these two lists, I have identified the following- the minimum amount of money needed to live without frustrations: a small house, food, internet, minimum taxes, money for hobbies, a bike and a garden. This is good, Claudia. If you look at my checklist, it is more than just budgeting and living within your means. We all need to look at things like – do we have the correct beneficiary designations if we were to die today? Do you have a life insurance to provide for your family if you were to die? DO you have disability insurance if you were to get disabled? These are the kind of things you need to think through and have answers for. I will be covering each of these items on my checklist in subsequent blog posts. Love this list! Looking forward to the tax planning post! Welcome to Stretch A Dime! I am glad you liked the Personal Finance Checklist. Yes, tax planning post is coming :). I have always wanted to get a view on Personal financing and with this checklist, I guess I will be able to learn a thing or two. Welcome to Stretch A Dime! There is plenty to learn :).